The ax or the tax? That's increasingly the question before cities, schools and counties in Minnesota as a tougher government spending environment plays out against a backdrop of a struggling economy. This Minnesota Public Radio News Ground Level special project shows the dilemma residents and leaders are coping with and the resolutions they are finding. The city of Lanesboro is implementing a local sales tax in order to help pay for infrastructure projects, like repairs to the city's dam and hydroelectric plant, and to make improvements to its community center and library. After whittling away at other services in response to reduced state aid, a struggling economy and declining property values, Minnesota cities are even asking just how much law enforcement they need. Cities, counties and school districts in Minnesota are paying out tens of millions of dollars this year because property owners are increasingly challenging their assessments in court. Brooklyn Park could become the first city in Minnesota with a union representing its part-time firefighters. If the unionization effort succeeds, it probably won't be the last. Many cities are stuck with unfinished housing projects, empty industrial parks and infrastructure expansions that once looked promising but now feel burdensome. Tough economic times are forcing cities of all stripes to re-examine how they spend tax dollars. 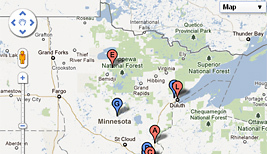 In Floodwood, many worry their actual existence is endangered. Unlike most outstate Minnesota school districts, Austin's is growing and it has placed before voters a $29 million expansion plan. Officials are expecting a close vote. The people of Nowthen, a city northwest of Minneapolis, have a choice to make this year: increase taxes or sacrifice police service. Looking to save money, cities are scaling back libraries by cutting hours, staff and acquisitions. Making ends meet while keeping taxes down has led mayors and city planners to look hard at their budgets and make choices. Chris Keenan has run a small cabinet-making business here for nearly 35 years, but the recession cut work and forced layoffs. Now, like businesses all over Minnesota, he's facing another blow with a property tax hike next year. The Legislature's decision to cut local government aid funding has compelled local officials across Minnesota to find ways to slash budgets and become more efficient. Grand Rapids is leading the way, trimming the budget, lowering property taxes and avoiding major cuts in services. Property taxes poised to push up rents in Minn. If you rent an apartment in Minnesota, there's a good chance your rent will go up next year. High demand and the fewest vacancies in 10 years are two big reasons. 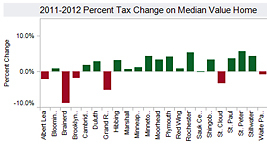 But a state change in property taxes is another big factor. Tax hikes and job cuts are two main themes emerging from recent trends and decisions Minnesota's 3,200 cities, counties, townships and school districts have been making the past several months. What is putting so much financial pressure on local governments in Minnesota? Eight communities especially worth keeping an eye on through 2012 and beyond as state fiscal policies, demographic changes and demands for efficiency continue to force hard decisions. As communities face tight budgets and calls for more efficient government, leaders have accepted the challenge to varying degrees. Readers have been sharing their views about property taxes and what they think of the local services. Read more about what they have to say and join the conversation. An MPR News sample of more than two dozen places shows that in most of them the estimated property tax in 2012 on a median value home is rising. Get more details in this interactive graphic. Ely residents are pushing back at city leaders who raised the tax levy by 20 percent to cover diminishing state aid. Why are Minn. property taxes going up? Most homeowners in Minnesota will see their property taxes go up next year. Watch this video to find out why. 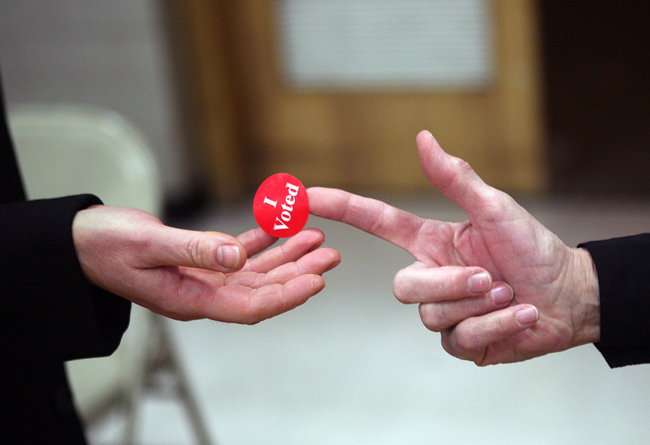 Most Minnesota voters said yes to tax levies in this year's election. But that doesn't mean their message is "please raise my taxes." A voluntary, non-partisan statewide organization that has assisted the state’s 87 counties in providing effective county governance to the people of Minnesota since 1909. The purpose of the Association is to support, promote and enhance the work of public school boards and public education. Our mission is to develop viable, progressive communities for businesses and families through strong economic growth and good local government. A closer look at Minn. Stat. 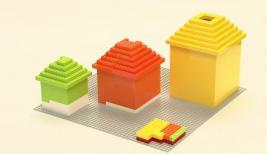 § 273.13, subd. 35. Explaining the new homestead exclusion in the 2011 omnibus tax bill.